Ambuchanania leucobryoides is a moss listed as rare under the Tasmanian Threatened Species Protection Act 1995. It is endemic to Tasmania and is monotypic at the genus and family levels. It is sister group to the widespread and speciose genus Sphagnum. 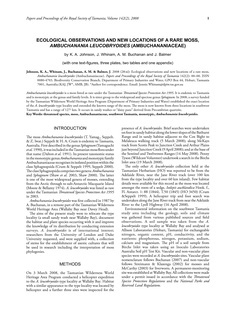 In 2008, a survey funded by the Tasmanian Wilderness World Heritage Area Program (Department of Primary Industries and Water) established the exact location of the A. leucobryoides type locality and extended the known range of the moss. The moss is now known from three locations in southwest Tasmania and has a range of 1272 km. It occurs in sandy washes or "daisy pans" derived from Precambrian quartzite. threatened species, moss, Ambuchananiaceae, southwest Tasmania, monotypic, Ambuchanania leucobryoides.